equipment. 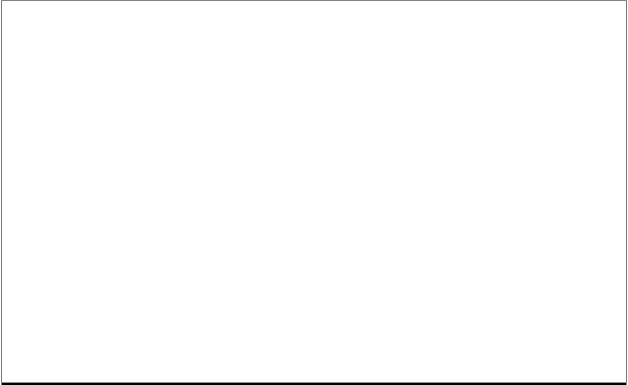 This document is copyright protected and any reproduction of this document or any part of this document is strictly prohibited, except as AB Sciex may authorize in writing. 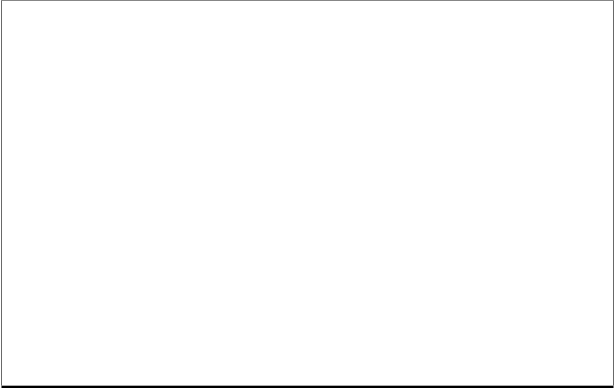 Software that may be described in this document is furnished under a license agreement. It is against the law to copy, modify, or distribute the software on any medium, except as specifically allowed in the license agreement. Furthermore, the license agreement may prohibit the software from being disassembled, reverse engineered, or decompiled for any purpose. Portions of this document may make reference to other manufacturers and/or their products, which may contain parts whose names are registered as trademarks and/or function as trademarks of their respective owners. Any such use is intended only to designate those manufacturers' products as supplied by AB Sciex for incorporation into its equipment and does not imply any right and/or license to use or permit others to use such manufacturers' and/or their product names as trademarks. AB Sciex makes no warranties or representations as to the fitness of this equipment for any particular purpose and assumes no responsibility or contingent liability, including indirect or consequential damages, for any use to which the purchaser may put the equipment described herein, or for any adverse circumstances arising therefrom. The trademarks mentioned herein are the property of AB Sciex Pte. Ltd. or their respective owners. 71 Four Valley Dr., Concord, Ontario, Canada. L4K 4V8. AB Sciex LP is ISO 9001 registered. This guide is for the site planner, the individual responsible for preparing the facility for the installation of the AB SCIEX QTRAP® 5500 system or AB SCIEX Triple Quad™ 5500 system. Note: If the site preparation tasks are not complete when the AB SCIEX Field Service Employee (FSE) arrives, the scheduled installation will be postponed. Caution: Potential Instrument Damage: Do not unpack the mass spectrometer crate or computer boxes. The FSE will unpack and move the mass spectrometer at the time of the installation. Verify that adequate space and the required shipping facilities are available. Refer to Site Layout Requirements on page 13. Provide all required electrical receptacles. Refer to Electrical Requirements on page 16. Provide all required regulators, shut off valves, and gases, as detailed in this guide. Refer to Gas Supply Requirements on page 20. Provide and install all required vents and ventilation devices. Refer to Ventilation and Waste-Collection Requirements on page 21. Provide a printer and (optional) active, tested LAN connection. Refer to Network and Computer Equipment Requirements on page 23. Verify that the requirements for the operating environment are met. Refer to Environmental Requirements on page 24. Provide the required solutions and laboratory equipment, including all equipment, fittings, and sample tubing required for the liquid chromatography (LC) equipment, unless purchased from AB SCIEX. Refer to Customer Supplied Solutions and Equipment on page 25. Complete the checklist in Site Planning Checklist on page 7 and return it to the FSE. Note: The FSE will follow up if the checklist is not received prior to the scheduled installation date. Supply all fittings, plugs, and cables required to connect the mass spectrometer to the electrical receptacles, and regulators, provided they are within the maximum distances described herein. 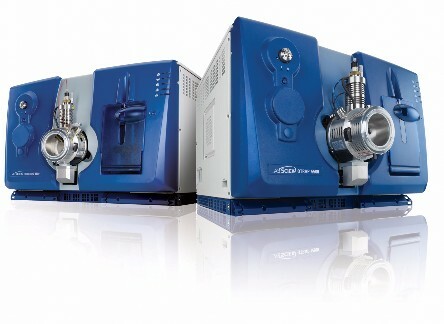 Assemble and set up any AB SCIEX benches ordered with the mass spectrometer. Test and qualify the system to the specifications in the Installation Guide. Set up LC equipment sold and supported by AB SCIEX. Integrate other supported LC equipment. Set up optional gas generator equipment sold by AB SCIEX only. After an FSE unpacks the system (with assistance from people at your site), it takes several hours for the FSE to set up the system and check its operation. When the system reaches proper vacuum, the FSE will perform installation qualification tests. During installation, the FSE provides a system and software overview, reviews data, and provides some basic operator familiarization. Training for auxiliary equipment supplied by other manufacturers is not provided by the FSE. Note: Online training is available at www.absciex.com/training. AB SCIEX and its representatives maintain a staff of fully-trained service and technical specialists located throughout the world. They can answer questions about the system or any technical issues that may arise. For more information, visit the web site at www.absciex.com. Caution: Potential Instrument Damage: Do not unpack or connect any components. The FSE will unpack, connect, and configure the system for the proper operating voltage. Refer to Site Layout Requirements on page 13. 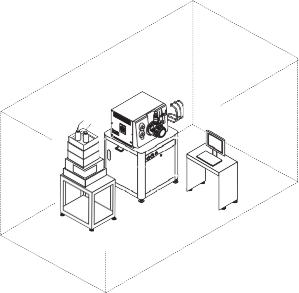 The measured building clearances can accommodate the equipment and crate dimensions. If the requirements cannot be met, contact the FSE. Refer to Electrical Requirements on page 16. The optional bench can be connected to the mass spectrometer branch circuit. Record the following values. The measured mains voltage over 24 hrs was:. The mains voltage source does not fluctuate more than ±10% from the nominal voltage. Note: Peripheral devices may have different mains supply fluctuation limits. device that will be used with the mass spectrometer. The mains supply includes a correctly installed protective earth conductor. Power Supply) on page 18. A qualified electrician has determined the appropriate mains supply configuration based on the system electrical specifications found in Table A-4 on page 19.
between 180 VAC and 264 VAC), 50/60 Hz. that comes with the device. Refer to Gas Supply Requirements on page 20. Are terminated with CSA/NEMA 6-15R receptacles. pressure of 120 psi (8.3 bar). Gas delivery lines are installed as required by local safety standards and regulations. Refer to Ventilation and Waste-Collection Requirements on page 21. Installation of plumbing and ventilation fixtures complies with local bylaws and biohazard regulations. A negative flow vent is provided with a total flow rate capacity of 283 L/min (10 cfm). the roughing pump, and at least 1 m (3 ft) above the floor. A fitting is provided for the source exhaust drain bottle with an o.d. of 1.3 cm (0.5 inch). The vent is within 1.5 m (5 ft) of the source exhaust drain bottle. The length and number of bends in the ducting system is minimized. The ventilation system uses smooth stainless steel tubing, with 45 degree elbows to turn corners. (Recommended) The blower for the source exhaust system is equipped with an indicator light. The length of the duct entering the blower is a straight length of at least ten times the duct diameter. The outlet end of the ventilation system is equipped with a backdraft damper and exhaust stack, and is away from open windows or inlet vents. The quantity of makeup air supplied matches the quantity of air exhausted by the system. Refer to Network and Computer Equipment Requirements on page 23. A network or IT specialist is available to connect the computer to the company LAN while the AB SCIEX FSE is present. A network computer name and domain password are available. An active, tested LAN connection is available. A network printer or a dedicated printer and necessary print drivers are available. Refer to Environmental Requirements on page 24. An ambient temperature of 15°C to 30°C (59°F to 86°F). The ambient temperature cannot change more than 2°C (3.6°F) per hour. each peripheral device that will be used with the system. The relative humidity level is 20% to 80%, non-condensing. Air conditioning provides a minimum of 6500 Btu/hr (mass spectrometer and roughing pump only). (Optional) A customer-supplied soft wall is installed behind the mass spectrometer to reduce noise. A bench is provided for the data acquisition workstation, located within 4 m (13 ft) of the mass spectrometer. Make sure that there is 1 m of clearance from the front, back, and left sides. Refer to Customer Supplied Solutions and Equipment on page 25. All required solutions are available. All required LC equipment and supplies are available. Tubing and fittings required to connect the supported LC equipment to the mass spectrometer are available. Complete site planning for peripheral devices and software, as required. Complete the online training. Go to www.absciex.com/training. Downloads > Mass Spectrometry User Guides. Complete the checklist and return it to the FSE email specified below on or before the Return Date. Note: The site must not be designated BioSafety Level 3 (BSL-3) or BSL-4. AB SCIEX does not install, service, or repair AB SCIEX mass spectrometers in areas designated BSL-3 or BSL-4. Check the weight and dimensions in Table A-1 and make sure that you can move the system to the installation site. Make sure that the installation site can accommodate the equipment dimensions, weight, and associated clearance. The mass spectrometer has been designed to support 77 kg (170 lbs). The mass spectrometer bench is designed to support the weight of the mass spectrometer plus its associated load, roughing pump, and an additional 77 kg (170 lbs). Figure A-1 to Figure A-4 show examples of typical configurations. Make sure the installation site meets the required building clearances. Refer to Table A-2. Mass spectrometer clearance requirement is 1 m for service access. WARNING! Electrical Shock Hazard: Use only qualified personnel for the installation of all electrical supplies and fixtures, and make sure that all installations adhere to local bylaws. 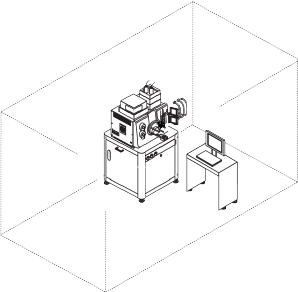 The total combined system (mass spectrometer and roughing pump) power consumption is 2200 VA (50 Hz or 60 Hz) at 230 VAC. You do not need an external line transformer for the mass spectrometer, optional mass spectrometer bench, or roughing pump. For installations outside North America, use locally approved standard connections and cables. If the voltage changes more than 10% in 24 hours, use a power conditioner. Have duplex receptacles: nominal 15A 208/240 VAC. Total of four outlets. Be equipped with CSA/NEMA 6-15R straight blade receptacles as shown in Figure A-5. The optional gas generator requires an additional separate branch circuit equipped with a CSA/NEMA 6-15R straight blade receptacle (208/240 VAC). 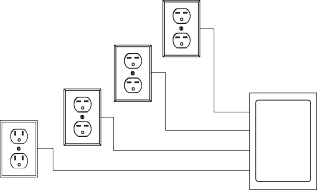 Additional outlets (120 VAC) are required for the computer, monitor, printer, and LC equipment. One 15 A branch circuit is required for the mass spectrometer.The optional mass spectrometer bench can be plugged into the mass spectrometer branch circuit. One 15 A branch circuit is required for the roughing pump. 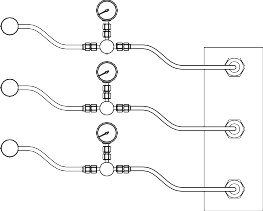 One branch circuit is required for the optional gas generator. Additional 120 VAC outlets for computer, monitor, printer, and LC equipment as required. In areas where the mains supply is subject to voltage fluctuations exceeding ±10% of the nominal value (200 VAC to 240 VAC), a power conditioner may be required. High or low voltages can adversely affect the electronic components of the mass spectrometer. Refer to Table A-3. Note: Peripheral devices may have different mains supply fluctuation limits. Check the mains supply fluctuation limit with the manufacturer of each peripheral device that will be used with the mass spectrometer. The mains supply must include a correctly installed protective earth conductor that must be installed or checked by a qualified electrician before connecting the mass spectrometer. WARNING! Electrical Shock Hazard: Do not intentionally interrupt the protective conductor. Any interruption of the protective conductor is likely to make the installation dangerous. Use a pure sine-wave UPS or power conditioner to maintain the system supply (mass spectrometer, computer, monitor, and roughing pump) during power outages. If you power the system from a UPS or power conditioner, it must meet the following specifications. 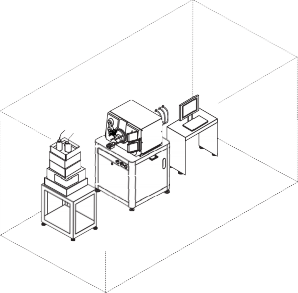 The following tables contain the electrical specifications for the mass spectrometer, roughing pump, mass spectrometer bench, computer, and monitor. Use high-pressure liquid nitrogen dewars or AB SCIEX approved gas generators. Caution: Potential Instrument Damage: Each supply must be separately regulated at the mass spectrometer otherwise over pressure can damage gas controllers. Zero grade air at 100 psi (max. ); flow rate of 22 L/min. UHP N2 at 60 psi (max. ); flow rate of 10 L/min. Note: All regulator output fittings must be 1/4 inch NPT to 1/4 inch Swagelok (Swagelok PN SS-400-11-4). Gas generator are available from AB SCIEX. Refer to the manufacturer’s documentation that comes with the generator for system specifications. WARNING! Radiation Hazard, Biohazard, or Toxic Chemical Hazard: Make sure that the laboratory is equipped with an appropriate ventilation system. 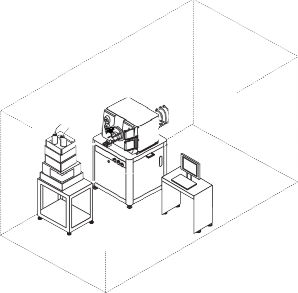 Adequate laboratory ventilation is required for safe operation of the mass spectrometer. WARNING! Radiation Hazard, Biohazard, or Toxic Chemical Hazard: Use only qualified personnel for the installation of plumbing and ventilation fixtures, and make sure that all installations follow local bylaws and biohazard regulations. Caution: Potential Instrument Damage: Do not connect the source exhaust hose to the vent. The connection must be made by a qualified AB SCIEX FSE. Provide a ventilation system with a total negative flow rate capacity of 283 L/min (10 cfm) at item 1 in Figure A-9. Provide a smooth fitting for the roughing pump, with an o.d. of 3.2 cm (1.25 inch). The vent must be within 1.5 m (5 ft) of the exhaust port on the roughing pump, and at least 1 m (3 ft) above the floor. Refer to Figure A-9. Provide a fitting for the source exhaust drain bottle with an o.d. of 1.3 cm (0.5 inch). The vent must be within 1.5 m (5 ft) of the source exhaust drain bottle. Refer to Figure A-9. Source exhaust drain bottle. 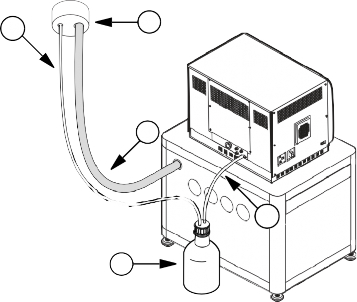 In this drawing, the capped drain bottle is shown at the back of the mass spectrometer, to make connection points visible. The drain bottle is located at the side of the mass spectrometer when installed. Roughing pump exhaust hose: 3.2 cm (1.25 inch) i.d. Make sure that the ventilation of the laboratory environment in which the mass spectrometer will be used complies with local regulations, and that the air exchange rate is appropriate for the work performed. Note: In the United States, OSHA 29 CFR Part 1910-1450 requires 4 to 12 air changes per hour in laboratories. Minimize the length and number of bends in the ducting system. Use smooth stainless steel tubing instead of flexible tubing to reduce friction loss or drag in the ventilation system. Use 45 degree elbows to turn corners. (Recommended) Equip the blower used for the source exhaust with an indicator light located near the mass spectrometer, so that the operator can easily see whether the blower is on. Make sure that the length of the duct that enters the blower is a straight length of at least ten times the diameter of the duct. Equip the outlet end of the system with a backdraft damper and an exhaust stack. Keep the exhaust outlet away from open windows or inlet vents. Supply a quantity of makeup air that matches the quantity of the air exhausted by the system. An airtight lab causes an efficiency loss in the exhaust system. Make sure that an IT specialist is available to install the security software while the FSE is present. Caution: Potential Instrument Damage: Other than security software, do not install additional software on the computer. Changes to the configured software could void the instrument warranty and cause the system to stop operating. The system can be connected to a network or dedicated printer. Make sure that the printer and any necessary print drivers are available before the scheduled installation. Make sure that an active, tested LAN connection is in place before the scheduled installation date. Make sure that a network specialist is available to connect the computers to your LAN while the FSE is present. The rate of the change in temperature should not be more than 2°C (3.6°F) per hour. Ambient temperature fluctuations may result in mass shifts in spectra. Caution: Potential Instrument Damage: Do not place the roughing pump in an enclosed unventilated area. Otherwise, it will fail prematurely or shut down from overheating and may cause severe damage to the mass spectrometer. Note: Operation of the mass spectrometer at altitudes higher than 2000 m (6400 ft.) above sea level may impact mass spectrometer performance. We recommend that you install a soft wall behind the mass spectrometer to reduce the reflection of sound generated by the equipment. Note: Peripheral devices may have different operating environment requirements. Check the operating environment requirements with the manufacturer of each peripheral device that will be used with the mass spectrometer. The packaged instrument was tested to confirm the effects of transportation do not impact instrument performance upon arrival at the customer destination. AB SCIEX has no specific data that relates to instrument performance under the effects of vibration. WARNING! Toxic Chemical Hazard: Follow all safety guidelines when handling, storing, and disposing of chemicals. For health and safety guidelines, see Health and Safety Precautions on page 27. Table for the computer and monitor. Refer to Layout Requirements on page 14. Determine what chemicals may have been used in the instrument. Refer to Safety Data Sheets if you are not familiar with the chemicals and the health and safety precautions that should be followed. Always wear assigned personal protective equipment, including powder-free nitrile gloves, safety glasses and a laboratory coat. Follow required electrical safe work practices. Avoid ignition sources when working with flammable materials, such as isopropanol, methanol, and other flammable solvents. Take care in the use and disposal of any chemicals. Potential risk of personal injury if proper handling and disposing of chemicals are not followed. Avoid skin contact with chemicals during cleaning, and wash hands after use. Comply with all local regulations for the handling of radioactive materials.